love your room colours. May I know what are the colours used on walls? Contour, contour, contourContouring is the buzzword of the moment. The sneaky make-up trick is all about accentuating and minimising facial features using different coloured foundations – and it’s a technique that not only belongs in your bag of beauty tricks, but your little black book of decorating ideas, too. Unlike facial contouring, which requires you to blend light and dark shades seamlessly together, strong contrast is key when using this technique in interiors. It’s the variations in tone that creates visual interest and helps define, enhance or downplay the shape, size and architectural features of a room. 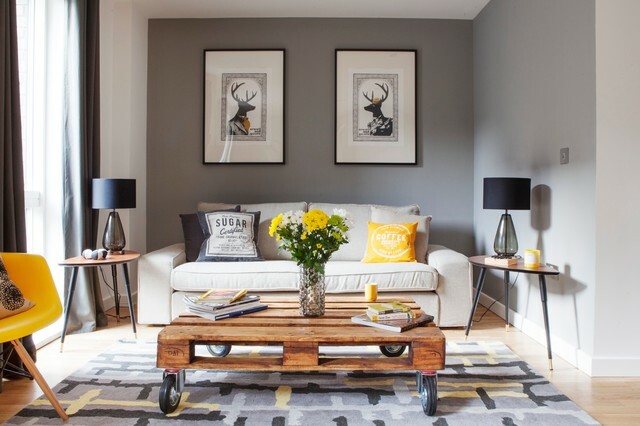 This cosy living area shows how the beauty trick can be adapted for the home using different shades of grey. Notice how the dark, moody wall colour adds depth and anchors the scheme, while the light grey rug, beige sofa, and white ceiling and accent wall make the room appear brighter and create the illusion of spaciousness. Solve the colour issueShacked up with a colour-phobe? You may well have to rein in your more out-there chromatic urges and shelve that idea of combining tartan wallpaper with a bright pink feature wall. Why not go along with their cautious leanings and agree to a neutral base, on the proviso you’ll be allowed to introduce a few accent colours through accessories in a mutually agreeable shade? Pallet with large castors used as a coffee table. Have seen a similar one with a glass top.